Do you love ice cream? Do you spend your time daydreaming about its creamy texture and rich flavor? Is your mouth currently watering thinking about that very first bite of deliciousness? Even in the coldest of winter months will you drive to the store to buy some ice cream, because you just can’t resist? If this sounds like you, listen up; there may just be hope for us ice cream lovers to have our ice cream…and our diet too. The number one down fall to loving ice cream, besides being potentially dairy sensitive, is that it may seem hard to eat it without ruining your diet. Well if you simply can’t go on without ice cream in your life (me), you may find these tips helpful for at least managing your love. First, lets start off with the obvious, portion control. Going to the grocery store and buying a gallon of ice cream may seem like a fantastic idea, but it’s a diet killer. Ideally you’d bring that bad boy home and eat a small bowl then put it in the freezer, but we all know seconds are only a spoonful away. Save yourself from the temptation and pass on the large buckets. Buying a pint size of ice cream isn’t a whole lot better. Although it may seem tiny, it can actually pack 4 servings of ice cream into that container. Eating a pint of ice cream in one sitting isn’t that hard to do either, so your best option is going to an ice cream place or restaurant and buying a single scoop. Not only will this allow you to have a proper portion of ice cream, but also once you leave the store half the temptation leaves with you. Out of site, out of mind. My next tip is being wise about your toppings. If you find yourself in a situation where a bowl of ice cream is the only option, try adding some fruit to that bowl and give your body some vitamins! Blueberries are a super fruit and can offer tons of health benefits. For more info on that check out this article. If you’re not into eating fruit with your ice cream, sprinkle some dark chocolate shavings for a sweet taste and extra boost of antioxidants. Next up, be aware of what you are putting into your body. 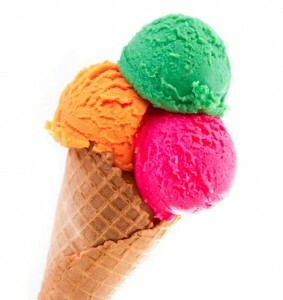 Some store bought ice creams are loaded with tons of ingredients that you may not even be able to pronounce. Try sticking with the ice creams that have simple ingredients like milk, eggs, and sugar. Hagen Das 5 would be a great example of this, they offer ice creams made up of five ingredients found in the typical fridge. The more aware you are with what you are putting in your body, the better. My last tip is to try an alternative. I know this kind of defeats the purpose of eating real ice cream but hear me out! Last year I bought a Yonana maker, and absolutely love it! It makes ice cream out of frozen bananas. You can add other ingredients such as chocolate or frozen fruits, but all you truly need are frozen bananas. It tastes slightly different than real ice cream, but if you’re serious about sticking to your diet, this option will trick that sweet craving into thinking you’re eating sweets! For more info on where to purchase a Yonana maker click here! I hope this helped you realize there may be hope for us ice cream lovers after all! It’s the 16th hour of Day 26. 14 Days remaining. Life lacks meaning and joy and is instead a cold harsh expedition. This is the log of my days without the one thing that I lose all willpower when it comes to its magnificent and monumental presence. This is a log of my days without…chocolate. Wait! Before you double check the website url, this is still a fitness blog site. You did not accidentally click a journal of a food addict. This is me admitting to you that as someone who tries to maintain a healthy diet, has its faults when it comes to sweets, especially chocolate. I chose to give up chocolate until Easter and let me tell you it’s been a long 26 days so far. With that being said, I am going to use this experience to talk about chocolate and how to curb chocolate cravings by making tasty and healthy alternatives! Cocoa nibs: Cocoa nibs are also referred to as “nature’s chocolate chips”. They are peeled and crumbled from whole cocoa beans and obtain a rich and yet pure chocolate flavor. They have plenty of antioxidants, vitamins, minerals and fiber. If you want to make a clean desert or just want to satisfy your sweet tooth try sprinkling these on yogurt, mix them with trail mix, or just eat them out of the bag like I do! Carob: This alternative contrasts from regular processed and sugary chocolate and has less chemicals. The cocoa bean naturally has a bitter flavor that is deluded with sugar, more so for milk chocolate than for dark chocolate. 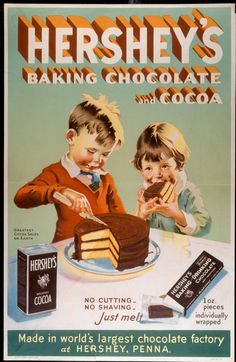 In addition to all of the sugar added to chocolate is complimented with oils, milk or cream. All of these added ingredients result in the product being hard to digest. Carob is a favorable alternative because it originally does not have a bitter flavor or grainy texture so it does not need sweetening or smoothers (oils and milk products). Date Bars: Dates are naturally sweet and rich tasting, therefore they pair with the bitter taste of raw cocoa nicely. This recipe for Chocolate-Coffee Date Bars uses dates as the sweetener to overpower the bitter raw cocoa instead of sugar. This treat includes baking chocolate (100% cocoa) almonds, walnuts, pecans, or hazelnuts, dates, raw cocoa or unsweetened cocoa powder, vanilla extract, and teaspoon of expresso powder. Although giving up a guilty pleasure such as chocolate can be difficult, I am always up for a way to apply creativity to my diet and these a few ways that you can too. A lot of us may think that finding a tasty alternative for chocolate is impossible, but you may be surprised as to all of the clean desserts that are possible. One of my favorite recipe sites My Clean Treats has plenty of recipes for delicious healthy desserts. Get creative and try whipping up a sweet concoction that’ll prove that you can have your cake (or date chocolate bar) and eat it too! Lately I’ve been looking for a new and exciting way to spice up my workouts. The summertime is overwhelming with activities to try, but in the winter it’s a little bit more difficult to find creative workouts. 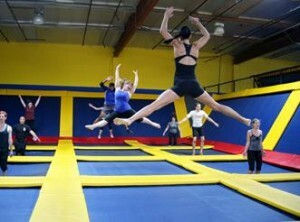 I stumbled across this indoor trampoline park, called Helium, online a few weeks ago and I knew imediately I wanted in. In all honesty, Helium is geared more so for young kids, but it sounded like so much fun I couldn’t resist. When I entered the park I was handed a pair of grip socks to wear around to prevent as much sliding and slipping as possible. They cost $2, but you get to keep them forever as a souvenir, so that’s pretty cool. Helium has many options of activities to try, such as rock climbing, casual jumping, trampoline dodgeball, and AIRobics. From the title of this blog, I’m guessing you know which one I chose. AIRobics. According to Helium’s website, AIRobics is a one hour cardio and strength training class that combines, “calisthenics, core exercises and aerobics.” We started the class with 30 minutes of cardio on the trampolines. This included jumping jacks, frog jumps, starfish jumps, high knees, and many other jumps. Each task was in one-minute intervals, so it kept the class moving at a fast pace. After 30 minutes of cardio we moved onto strength training and abs. We did many different types of moves such as push-ups, planks, leg lifts, and overhand ball tosses. By the end of the hour, well to be honest after about 10 minutes, I was feeling the burn. Doing things that may seem simple on the ground becomes 10x harder on trampolines. It triggers your muscles to work extra hard while trying to maintain balance. I also had a chance to talk a little to the regulars who came to the class to see what their opinion was. It turns out long term wise, the class may be able to improve lost flexibiltiy due to an accident or surgery. One man lost almost all his mobility in his shoulder at one point, but after a year of AIRobics he said that there was a huge improvement in his joint movement. The class instructor got started with AIRobics after she had knee surgery from tearing her acl. To get back in the game and over fear of intense excersize, AIRobics helped her ease into regaining her strength. It cost $10 per class, or $80 for ten classes. Whether you are looking for a fun, intense workout or muscle strength recovery, AIRobics could be just what you need! I went to the Helium Trampoline Park in New Berlin, but there are many locations! For more info please check out their website. Run, run, run, every day is another day to see how many things I can accomplish. I am always on the go, whether heading to work, class, or workout. I always keep a snack in my backpack to make sure that I never am hungry. My latest snack that I can’t keep myself from indulging in more than once a day: homemade energy balls. I am sure you’ve seen this recipe before, although have you tried it? If you haven’t, maybe once I dissect the nutritious ingredients you will be more willing to give it a go! 1 cup whole rolled oats, 5 tablespoons natural crunchy peanut butter, 2.5 tablespoons honey, 4 tablespoons ground flax seed, and ¼ cup mini dark chocolate chips (optional). Mix all of the dry ingredients in a large bowl. Combine the honey and peanut butter in a microwavable bowl and melt/warm the two ingredients together. Pour over the dry mixture and stir. 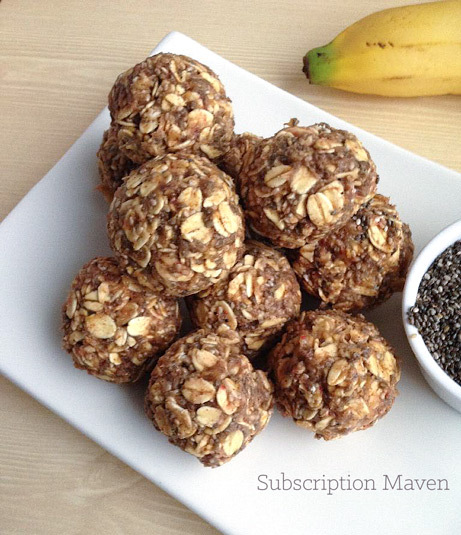 You can either roll them into 1-inch balls (serving size) or put them in a pan and cut them like granola bars. Whole rolled oats: Where this ingredient lacks flavor, it makes up for it with its nutritious values. Rolled oats have been found to be a great blood sugar stabilizer. When your blood sugar is stable, your body will react less to temptations of sweets. Also, the high content of fiber keeps you feeling full and also helps with digestion. Flaxseed: It is high in vitamins and minerals that have been found to increase your heart health. The high level of fiber content in flaxseed keeps you feeling more full because it expands once it is digested and helps curve your appetite. The combination of the sweet honey, the salty peanut butter, mixed with the oats, fiber and some chocolate chips, is the best. Choosing to make your own homemade granola bars (or energy balls in this case) is much more cost effective and is also healthier. There are no preservatives in this recipe, and the cost is comparable to buying a box of Nature Valley Granola Bars every week when you are grocery shopping. The best part is that you don’t need any certain utensils to make it and you can prepare this snack in bulk. It lasts for a long time if you keep them refrigerated as well. I encourage you to give this recipe a try, because I know you will be just as addicted as I am!